An account that can be open instantly using a smartphone in a paperless way is known as a digital saving account. For the people who are tech-savvy and comfortable with technology, can open a digital saving account. The main advantage of digital saving account is it can be opened online, through website, smartphone or tablet instantly. If you are planning to open a new bank account you can consider opening a digital saving account. 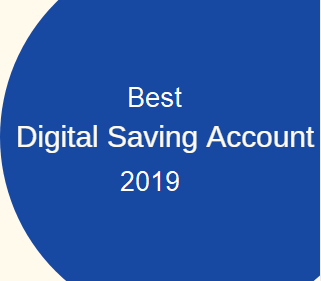 Here are 5 Best Digital Saving Account in India. All these saving accounts are shortlisted based on ease of opening account, a rate of interest, rewards, documentation, and features offered by the bank. Digibank is digital bank. It is very easy to open a saving account using Digibank. No paperwork is required. You just need to verify your details via OTP on your Aadhaar linked mobile number. Your account will be active instantly. All you need is a smartphone and digibank app. Key features of Digibank digital saving account are given below. Digibank DBS is Zero Balance account. The rate of interest on saving is up to 7%. DigiSavings Bank gives you physical debit card which is widely accepted. You can connect with other accounts using DigiBank UPI. You can get exclusive deals and cashback for this account. It also offers budget optimizer which can be used for tracking expenses etc. You can also use this account for making investment in the Mutual Funds. Kotak 811 Edge is next in the list of Best digital Saving account. Kotak 811 Edge is simple, easy and cashless solution for the tech-savvy customer. Kotak 811 Edge account can be opened easily using website, app or by visiting nearest branch. You can get complete digital and paperless account opening experience. Key Features of Kotak 811 Edge are given below. Average monthly balance requirement for Kotak 811 Edge account is Rs.10000/-. The rate of interest on saving is up to 6%. You will get platinum debit card for a fee of Rs.150 per annum. Online transaction IMPS, NEFT & RTGS is free. Cheque book facility is available. The account can be accessed on mobile or by visiting branch. SBI Insta account offered by SBI comes with the instant account activation facility and does not need the applicant to visit the branch. Only resident of India, above 18 years of age, without any tax liability outside India is eligible for opening SBI Insta Saving Account. This account can be opened via YONO app or using YONO SBI portal. Key features of SBI Insta Saving Account are given below. Complete paperless account opening. OTP based e-KYC. No minimum balance charges till 31st March,2019. Free RuPay Debit card for the customer. Maximum balance amount under this account is 1 Lakh. Passbook and cheque book facility not available. The savings account by SBI can be opened and operated on a single basis. Federal Bank Fedbook Selfie Account is easy to open digital account. You just need to take selfie to open this account. FedBank Selfie App is required for opening this account. One time visit to branch is required for the activation of this account. Online KYC validation is required from Aadhaar Linked mobile. It is a zero-balance account. Key features of Federal Bank Fedbook Selfie Account is given below. Quick account opening and instant account number generation. Rupay Classic Debit card can be issued with annual charges. Cheque Book facility with limited cheque available. Average monthly balance and transaction charges are zero. Axis Bank ASAP is one of the best digital saving accounts. Axis Bank ASAP account can be opened by downloading Axis Mobile App or by visiting the Axis bank website. It is a zero balance account and offers the highest rate of interest on balance above Rs.10000. Key Features of Axis Bank ASAP Online Saving Account are given below. It is zero balance account which can be opened using app. You can avail Virtual Debit Card Facility with this account. You can create auto sweep flexi FD facility on balance above Rs.10000. You can avail various deals and save big money on online shopping. Debit card facility available with annual charges. Fund transfer is free using NEFT, IMPS or RTGS. Do you think Digital Saving Account is beneficial?